Is Microsoft planning to drop its overpriced Xbox 360 Memory Units in favor of more affordable USB mass storage devices? According to documentation obtained by Joystiq, the answer is yes. Currently the only external storage solution for the Xbox 360 is the Microsoft-produced Memory Unit, a relatively expensive way to add up to 512MB of storage to your console. 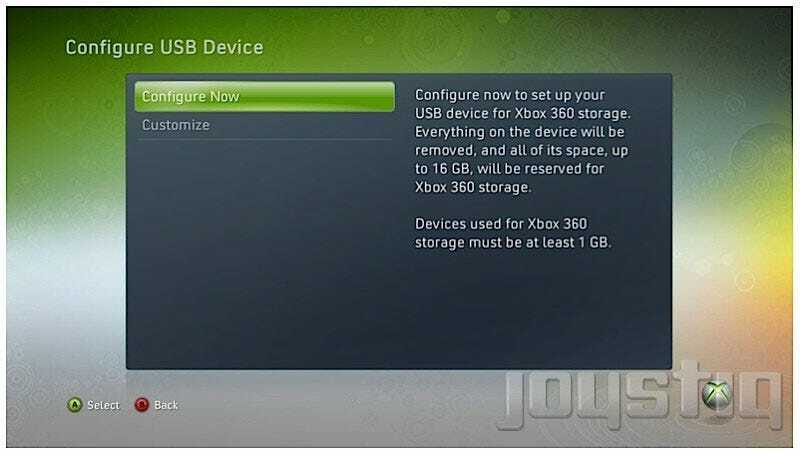 That could all change this spring, according to Joystiq's information, when the Xbox 360 receives an update that will allow standard USB storage devices to function as Xbox 360 storage. According to the documentation, the update will allow consoles to recognize USB drives from 1GB to 16GB, formatting them with an Xbox 360 system partition of 512MB, with the remainder of the space used to store game saves, DLC, Xbox Live Arcade titles, and even disc-based games, which can be played from the drive as long as you have the original disc inserted in the console. While this seems like it could be a good way to get around paying through the nose for an overpriced Xbox 360 hard drive upgrade, Joystiq points out that only two devices can be registered to a console at a time, for a grand total of 32GB of additional storage. If this proves to be true, it's an interesting and cost-effective solution to add a few more gigs of storage space for those of us rapidly filling up their original Xbox 360 hard drives. We've contacted Microsoft for comment on this rumor, and will update should any new information arise.